Quickly obtain digital copies of Title Deeds for over 28 million properties throughout England and Wales. 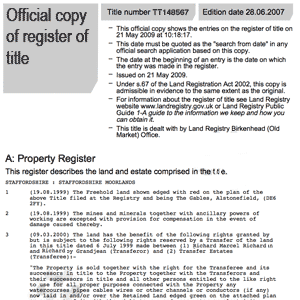 The Land Registry Title Plan displays an outline of the property and its surroundings, often with coloured markings indicating rights of way, shared access, land covenants and watercourses. Use our Map Search to identify the land you wish us to search. This option can be used for fields, waste land, woodland, moorland, lanes, rivers, riverbanks and disused buildings. We are a private company independent of individual government land registries and provide professional and easy to use Land Registry services throughout the whole of England, Wales and Scotland. Some of our documents can be obtained direct from HMLR for a lesser fee. 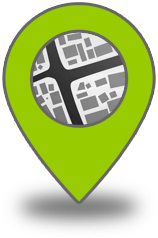 Our online Land Registry services are available to the general public and all commercial and public organisations throughout the day and night, 7 days a week, and are designed for ease of use, speed and efficiency. We provide copies of the Land Registry Title Register, Title Plan, Lease and Deeds in addition to many other documents relating to property boundaries, rights of way, property history, and other conveyancing and environmental documents. We are an independent organisation established in 1998 and are not affiliated with the Government or with HM Land Registry. Some of the documents we provide may be obtained direct from official sources for a lower fee but without the many benefits offered by our online portal. Section A is the part of the register that describes the property by reference to its address and states that it is shown on the Title Plan as the land contained within red edging. It also details matters that benefit the land, such as easements which are private rights to use another's property without owning it, and such as a right of way over adjoining land, a right of light, right of access or right of support. Section B provides details of the current owners and their addresses (there can be up to 3 addresses for each owner, including an email address in some cases). It also provides the date of purchase, the purchase price (for properties registered or purchased after April 2000), details of any personal covenants and details of any restrictions or notices. Section C deals with matters that incumber the property such as leases, mortgages and charges. The Title Plan is provided to a scale of 1:1250 in urban areas and 1:2500 in rural areas. They often contain coloured markings that refer to rights of way and parcels of land affected by covenants. The Title Register describes what the coloured markings refer to. 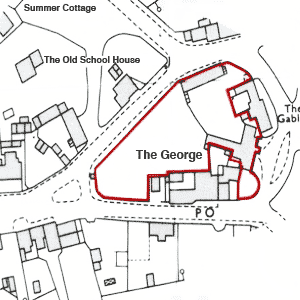 The area contained within the property title is shown by thick red edging. Everything within the red edging forms part of the Title save for any areas within it that are edged in green. Such areas have been removed from the Title, usually following a sale of part of the land. Land-Title-Deeds.co.uk is an independent supplier of Title Documents and Conveyancing Searches. We are not affiliated with the HM Land Registry.